It is the ultimate luxury for any part of your body. Use it on hands, feet, elbows or all over. Our whipped butter is a special blend of shea, mango and cocoa butters along with apricot kernel and jojoba oils. Very good for mature dry skin. Once you've indulged you're hooked! 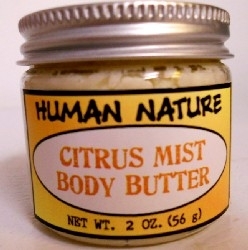 Ingredients: Shea Butter, Mango Butter, Cocoa Butter, Jojoba Oil, Apricot Kernel Oil, Essential Oils of: Orange, Tangerine, Grapefruit, Lemongrass, Tocopherol (Vit. E). Since our butters are made from butter & oil, please keep from direct sunlight or extreme heat. If melting occurs place in a cool place & the butter will solidify. Packaged in a plastic jar with screw top lid. Available in 2 or 4 oz sizes.